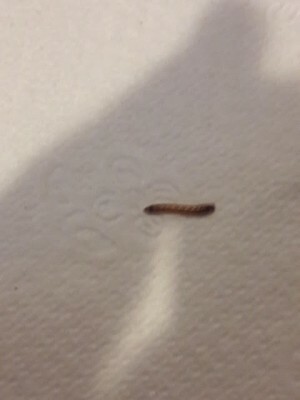 Today we will respond to a reader who reached out about some brown worms she noticed in her home. 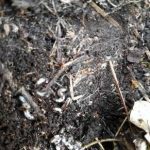 She first found the worms in her front room and on her couch. 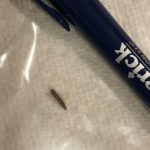 She explained that she thought she had the source figured out and contained, but now has seen individual worms in random places like her garage and bathroom sink. She wants to know the identity of these worms so that she can begin the process of eliminating them from her home. The photograph she sent shows a light brown creature with a clearly segmented body. The segments near its head and tail have dark brown rings on them, and the segments in the middle of its body are lighter brown. We are confident that this specimen is a mealworm! Although the word “worm” is in the name, mealworms aren’t actually even worms! 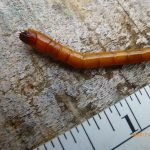 They are the larvae of mealworm beetles (known as Tenebrio molitor in the scientific community.) Mealworms prefer to live in the outdoors where they can eat decomposing, damp, and moldy things like leaves, animal waste, and dead insects. 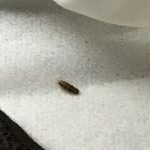 However, they are also common household pests since they will just as happily munch on moist stored grains or stored pantry food items that are on the brink of going bad or are already in the process of decaying. Other than a pantry with plenty of potential food sources, mealworms like to live in dark, cool, and moist locations. 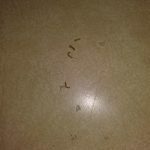 After basic cleaning of any areas where she finds mealworms, we encourage our reader to focus on preventing future mealworm infestations. 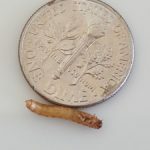 She can buy her dried food items in smaller quantities to prevent them from going bad, and buy airtight containers to store her grains in, or make room in her freezer for these items to keep out mealworms and other pests. Finally, she can make her home less inviting to insects by making sure all the windows, doors, and ventilation systems are sufficiently screened and/or sealed, and by installing a dehumidifier to reduce the moisture levels of her home. 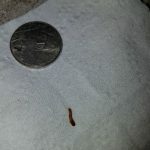 In summary, one of our readers found several brown, segmented “worms” in her home. We believe these creatures are mealworms, which are common household pests. As with most insects, eliminating mealworms from a home just requires a little investigating and some dedicated cleaning. 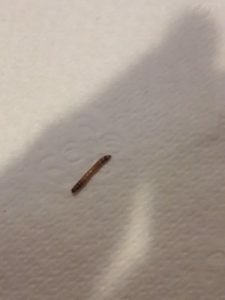 One of our readers found several brown, segmented "worms" in her home. We believe these creatures are mealworms, which are common household pests. As with most insects, eliminating mealworms from a home just requires a little investigating and some dedicated cleaning.